Use the printable pattern in this project to create a small centerpiece for St. Patrick's Day that consists of several sizes of paper shamrocks and a shamrock vase. Make several of these cute little vases as party favors, or as gifts for St. Patrick's Day. The plain version of the vase can be used for other occasions and be filled with Paper Flowers. 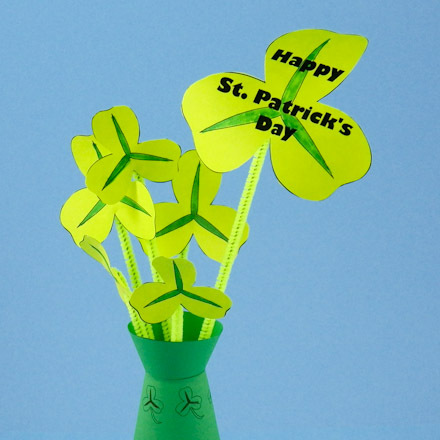 Related crafts: Checkout St. Patrick's Day crafting for more shamrock crafts and downloads. Choose a Shamrock Centerpiece pattern to print. Use the color pattern with white paper, and the black & white pattern with green paper. For another holiday or occasion, or for the most creative flexibility, print one of the plain vase patterns. The Shamrock Centerpiece patterns include pattern pieces for three sizes of shamrocks, stems and one vase. Cut out each pattern piece on its black outline. Also, snip the two tiny lines at the top of each stem. Tip: If you printed the black & white pattern on white computer paper, use a green marker to color in all of the shamrock and stem pattern pieces before cutting them out. To form the vase's base, put a small amount of glue on the glue tab. The glue tab is marked by the dashed line. Form a cone shape by overlapping the other edge to the dashed line. Do the same for the vase top. Place the base with the large end down. Put a bead of glue around the top edge of the base, and insert the small end of the top piece into the base. Tip: Use the toothpick to spread the glue. 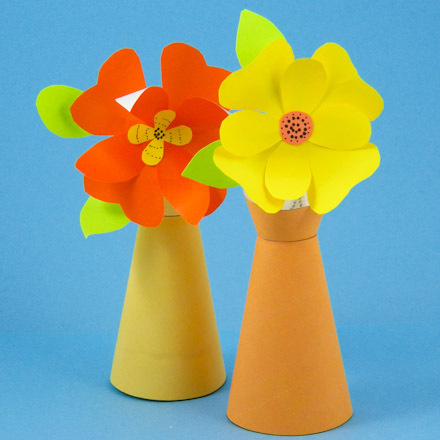 Add a ring of cardboard cut from a toilet paper tube to make a more stable vase. Set TP tube on end and place the vase over it. Mark a pencil line on the TP tube at the bottom of the vase. Cut on the line. Test the ring to see that the vase fits snuggly over it without any TP tube showing. Trim if needed. Apply a bead of glue around the top of the TP tube ring and place the vase over it. (optional) To keep the shamrock stems in place when you lift the vase, cover the bottom of the vase's cardboard ring with tape or a circle cut from cardboard. Carefully fold all of the stem pieces lengthwise. The wider end will be the bottom. 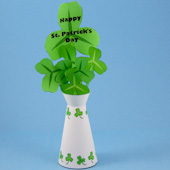 Unfold the stems slightly and insert a shamrock into the tab cuts on each stem. Apply a dab of glue with the toothpick to secure the shamrock to the stem. Insert the shamrocks into the top of the vase. They should fit snugly in the vase's small hole. If they don't, it will be harder to make a pleasing arrangement. To ensure a snug fit, you can open the stems wider, or cut a length of chenille stem to insert alongside the stems. Rearrange the shamrocks so that the one with the greeting on it shows, and the others look pleasing. That's it! Now enjoy your little centerpiece! 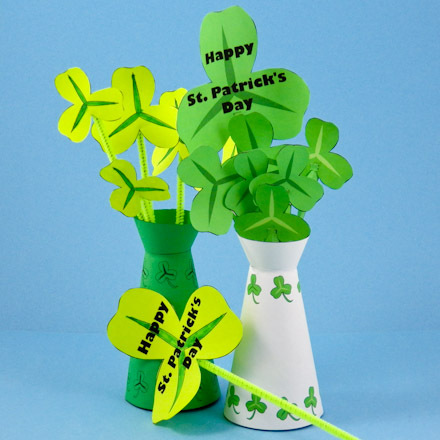 Tip: Use these ePapers— Shamrocks on Light Green, Shamrocks on Pale Blue and Shamrocks on Medium Green—to make the vases in this project or in card making. Tip: The vase in this project can be used for other occasions. Print the Plain Vase pattern on white or colored paper, and fill it with Paper Flowers. Tip: It is easier to arrange the shamrocks if the stems fit snugly in the vase. Open the stems wider, or add a short length of pipe cleaner or soda straw to ensure a tight fit. Tip: You can make the shamrocks with chenille stems (pipe cleaners) instead of folded paper stems.